It’s probably one of the most colorful fruits I’ve ever seen, and it’s easy to tell where it gets its name. This is Dragon Fruit, and it’s not usually going to be found in your normal American grocery store. It’s bright pink, and the contents are actually quite good to eat as is, so long as you actually consume them correctly. This tropical fruit is a vibrant pink with yellow and green tipped spines that shoot out of the outer layer. Most people don’t know this, but Dragon Fruit is actually a form of cactus, native to Mexico, Central America, and South America, as well as parts of Asia, such as Cambodia, Malaysia, Thailand, and of course, Vietnam. The fruit has many names depending on what part of the world you’re currently in. In America, and other english-speaking countries, you’ll probably hear it called Dragon Fruit. In Vietnam, they call it Qua NAME. The production of Dragon Fruit has been greatly accelerated in Vietnam in the last few months, due to the increased purchasing price of the colorful fruit. I don’t blame them really… rice is probably getting boring. It’s also sometimes called ‘pitaya’ in South America, and the Dragon Fruit texture is often compared to that of a kiwi due to the tiny black seeds inside, and many people describe the taste as somewhere between a kiwi, a pear, and a watermelon. So, if you like those three fruits, you’ll likely enjoy the taste of Dragon Fruit. 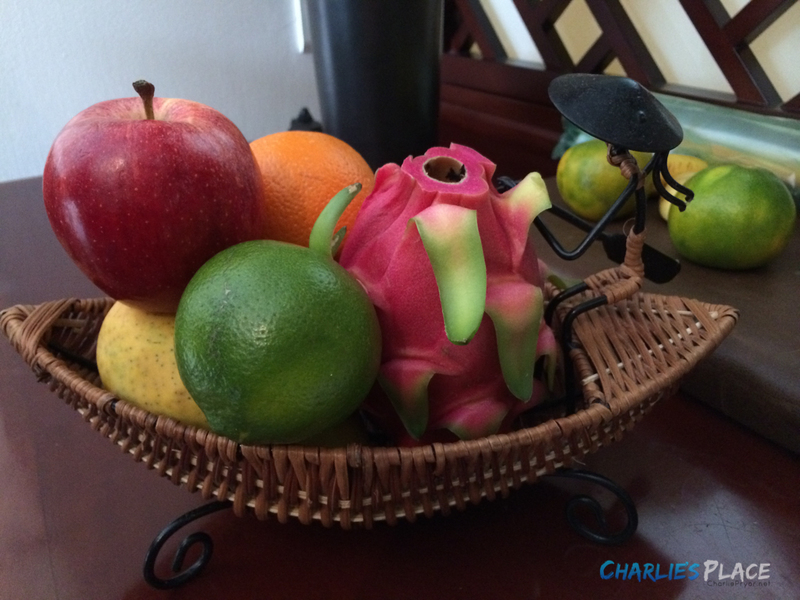 A few members of my family, while they were here in Vietnam anyways, gave Dragon Fruit try. My parents even received one in a fruit basket when the hotel apologized for their room having a faint smell of smoke. This is a basket my parents received as an apology from the hotel. Yes… they kept the cool basket too. Not everyone tried it, and there was a mixed reception, but it turned into an essential part of every meal for my brother Nick, who simply loved the stuff. I find it delicious as well, and since we have fruit for dessert every meal here, it’s quite convenient that this country is one of the primary producers of this awesome fruit. Remember though that you don’t have to go off to an exotic country to get your hands on Dragon Fruit either. While you likely aren’t going to pick it up at a normal grocery store, you can usually find them in Asian grocery stores in a Chinatown or someplace similar around the country. 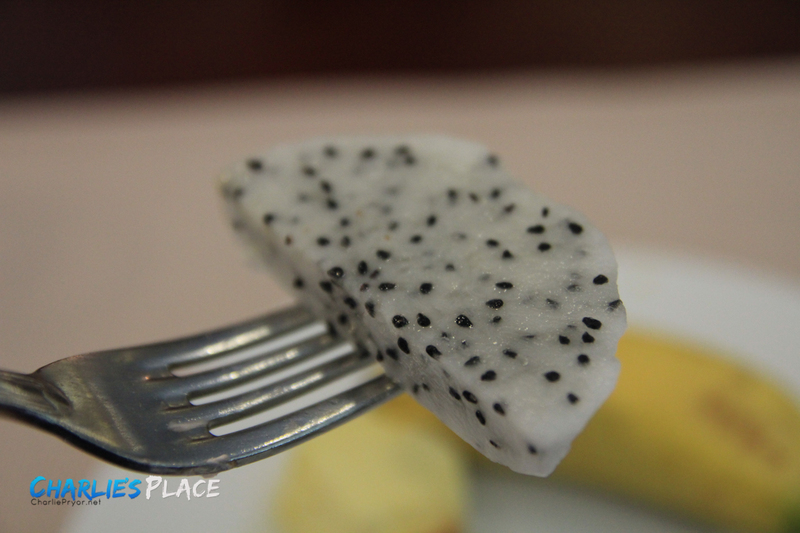 When choosing a dragon fruit, look for a specimen with bright, evenly colored skin. If it has too many brown blotches, or if it has a dry, shriveled stem, it’s probably overripe. If the fruit is very firm, let it ripen a few days until the flesh gives slightly. Took this photo while eating lunch at the hotel. So good! The fruit is also fairly simple to cut. simply slice it in half, crack it open, and that’s really all there is to it. The flesh inside can be white or red, depending on the variety. You can scoop out the flesh of the fruit with a spoon, removing it from the bright pink husk, which is not edible. Make sure you get all of the skin off the fruit before you eat it though. The skin should not be eaten. Have you ever tried Dragon Fruit? If so, what did you think of it, and where do you normally find it? Let others know your thoughts about it in the comments down below. We have found it sometimes at Meijer.